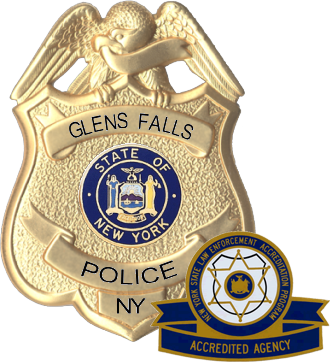 The Glens Falls Police Department consists of 29 sworn members and 2 civilian employees. The city of Glens Falls is located approximately 50 miles north of Albany, in Warren County New York, and serves a population of 15,000 residents. It covers an area of 3.8 square miles and it’s Police Department has 30 sworn members. The department is headed by Anthony P. Lydon, who has served as Chief of Police since March of 2016. Chief Lydon has served the city of Glens Falls for 17 years. Assistant Chief Joseph Boisclair is second in command of the department and has served the city of Glens Falls for 18 years. The Detective Division of the department is under the command of Detective Lieutenant Pete Casertino, who has served the city of Glens Falls for 22 years. The detective division consists of 3 detectives that are tasked with conducting criminal and drug investigations into offenses committed within the city of Glens Falls. The Patrol Division of the department is under the command of Lieutenant Shawn Lovelace, who has served the city of Glens Falls for 14 years. The patrol division consists of 4 sergeants and 19 police officers. The patrol division is tasked with protecting life and property, responding to calls for service, conducting thorough preliminary investigations, enforcing laws and ordinances, crime prevention, and fostering community relations. In 2018 the department handled 13,726 calls for service. Our officers made 1,475 arrests and of those, 302 were drug related offenses. We investigated 564 motor vehicle crashes, issued 2,188 traffic tickets and 5,163 parking tickets. The police department’s full 2018 annual report has been posted to the site.